Weather forecasters are predicting the coldest winter in a decade due to the Pacific El Nino effect. This will offset the present lower energy costs and produce very high heating bills this winter. BioTech Research, the parent company of the famous EdenPURE Portable Heater expects a surge in consumer demand. "We are increasing inventory and advertising expenditures across all media as well as launching our new infomercial starring Bob Vila," stated Julius Toth, Director of Product Development at BioTech Research. Bob Vila, America's favorite home improvement expert, uses an EdenPURE portable heater in his Massachusetts home. "My EdenPURE allows me to keep my thermostat turned down much of the time and that saves me money," commented Vila. TV and Radio Home Makover expert, Leslie Segrete also recommends the EdenPURE heater. Leslie Segrete states, "Our New York home is almost 100 years old and like any older home it has cold, drafty areas. 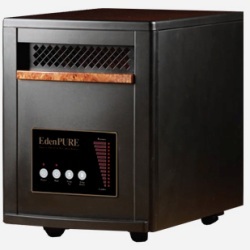 I keep an EdenPURE in my living room to help regulate the temperature." Segrete added, "Having a 1 year old son I worried about space heaters and the dangers of fire. I don't have to worry now because the EdenPURE is absolutely safe. There are no exposed heating elements that can cause a fire. That's why the EdenPURE is the choice for fire and safety professionals." Vila and Segrete appear in advertising together for the EdenPURE portable heater. The EdenPURE hit the market in 2005, has sold over 1 million heaters and has been nationally marketed and previously endorsed by the late Paul Harvey. "With over 1,000,000 EdenPURE portable heaters sold EdenPURE is #1 in both savings and reliability. Remember not all heaters are the same. There are many imitators on the market but only one EdenPURE," said Toth.